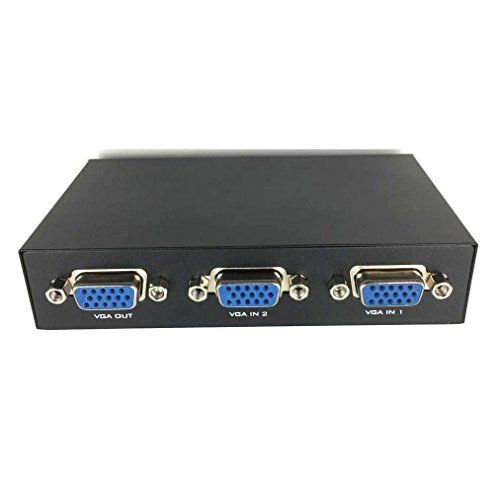 This is 2 Port VGA Switch,it connect 2 PC in to 1 monitor out manual switch.It is manual control to you to make 2 computers share one monitor, projector. Conversely, share 1 computer with 2 monitor, projector not simultaneously. Displays the video output of 2 computers on a single monitor or projector.Quick and easy switching between VGA sources via front panel pushbuttons. Provides up to 250MHz bandwidth for video clarity, Supports VGA resolutions up to full HD 1920x1080 and WUXGA 1920x1440. Auto-detect display DDC information for the optimal resolution. Supports VGA, SVGA, UXGA, WUXGA and multisync monitors. Simple button switching and high quality metal enclosure; plug and play.